In your gift guide comments I see a lot of people say they give Food as a present. Great choice because who doesn’t love that! It pleases everyone and you know it will get used. From meals to sweet treats, this post is full of fabulous food for gifts ideas. 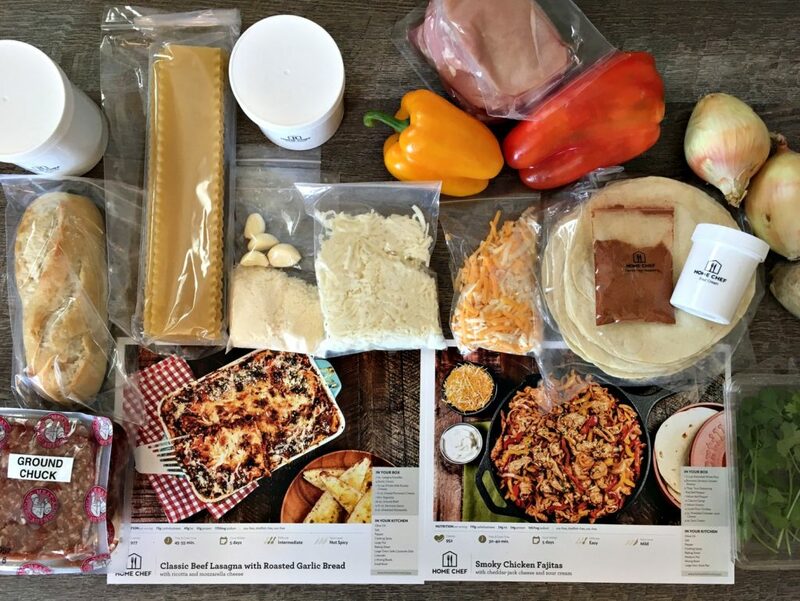 Home Chef – Dinner Delivered in a Box. Meal delivery services are the best invention ever. I love them! Meal planning and food shopping are two tasks that I dread every week. I hate coming up with new meal ideas and trying to accommodate picky kids, while still cooking healthy foods. Plus, what a great gift for college students, full time working moms, grandparents who need easy, and well just about everyone I know! Family size meals. Finally a delivery company who caters to families and has kid-friendly dinners. Many choices every week. Swap what your family will like. 30-minutes or less is what they aim at. Not hours! Everything takes me hours in the kitchen. Easy to skip. I skip all the time, so really only order a box once a month or so and that is great for us and makes my life a little easier. Try it Today and get $30 off your first order! Tucson Tamale – Box of Happiness right to your door from Tucson, AZ. oh la la! Made by-hand from scratch with non-GMO organic corn. I KNOW you want to try them! That is their sampler pack above, but you can choose vegan or vegetarian options only. This was two plus dinners for us and everyone got to mix and match their favorites. I served with chips and quac and it was the perfect meal. A treat really, because how often do you get homemade tamales? Did you know tamales are a traditional Christmas treat in Mexico and the Southwest? So yummmmmy! Order them and use code: courtney15 for 15% off your order! Who is the person on your list who pours hot sauce on every meal? I know exactly who I am gifting this to! For over 20 years Dave has made clean, organic, speciality foods. 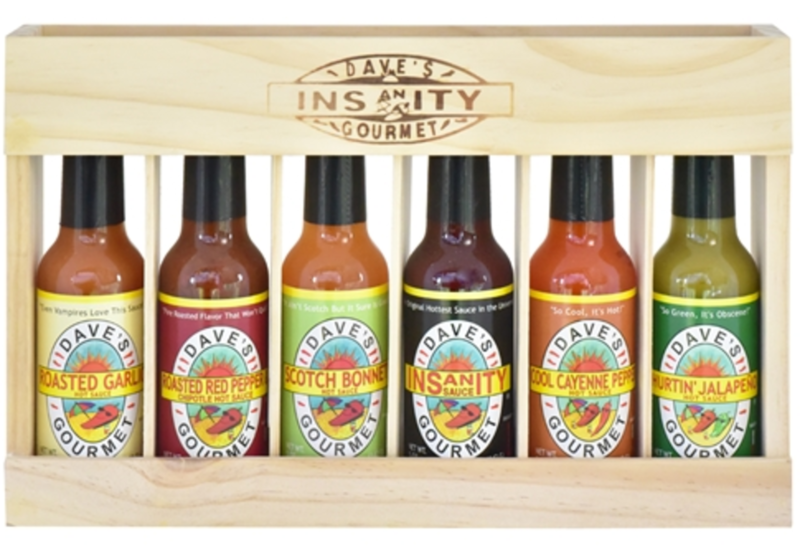 This Spicy gift box is perfect for the holidays and contains six different hot sauces in a fun wooden crate. Included are Roasted Pepper & Chipotle Sauce, Roasted Garlic Hot Sauce, Scotch Bonnet Hot Sauce, Insanity Hot Sauce, Cool Cayenne Hot Sauce and Hurtin’ Jalapeno Hot Sauce. Available for $19.99 from Black Friday thru Cyber Monday. You can grab a 4pk Super Hot too! Check out all Dave’s Gourmet specialities! Half way through my Fabulous Food for Gifts Guide. Now for the sweet treats. You’ve waited patiently. 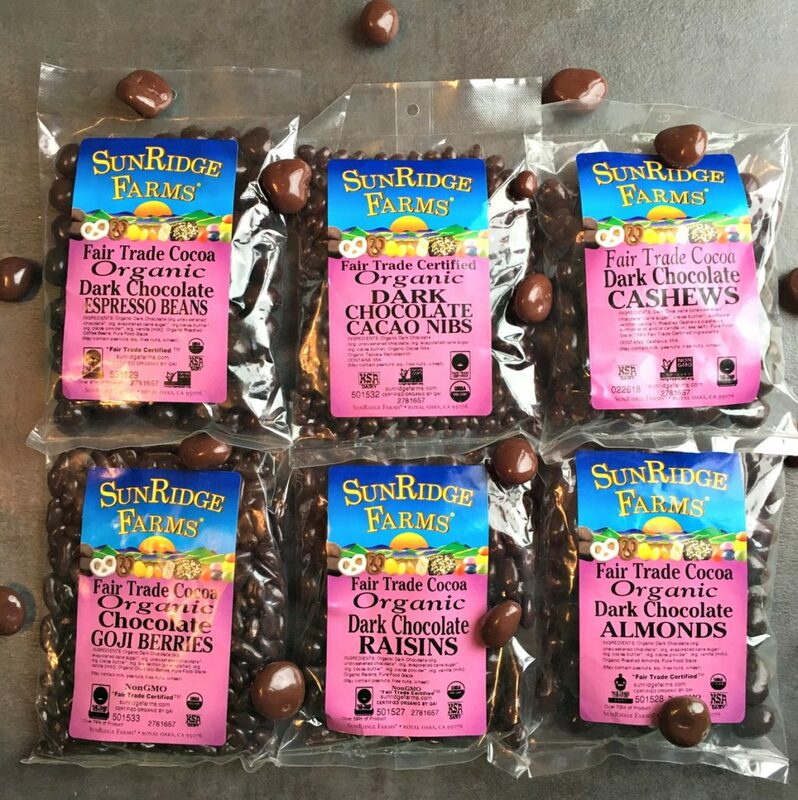 SunRidge Farms – Organic, Fair Trade, Chocolate in Bulk! I started nibbling right away and discovered later I didn’t get my picture first. Whoops. Those are milk chocolate cherries loose in that photo and boy are they wonderful. It’s alllll de-lish! Every purchase of SunRidge Farms’ Fair Trade Certified chocolates helps support sustainable agriculture and the health and rights of more than 42,000 Fair Trade Cocoa farmers and their families. It’s chocolate you can feel good about! Visit SunRidge Farms and you’ll find a HUGE selection of chocolate, nuts, dried fruits, spices, seeds and much more. Something for everyone. Buy in bulk at their online store, Whole Foods Markets nationwide or on Amazon. Look for them! I love Justin’s story because he is a local guy who developed a yummy nut butter, then kept going to add chocolate to it too! These snacks are greeeat for the stocking this year. Organic Peanut Butter Cups – you will never go back to the ‘originals’. You know who I mean! Almond Butter + Pretzels or wait, Chocolate Hazelnut Butter + Pretzels – yes! Peanut Butter + Bananas make the perfect school snack. Kids just love to dip! Shop online at Justin’s Nut Butters or on Amazon, though they are probably in a store near you. Check on their site and see! Hampshire Toffee handcrafted in small batches in New England. We are a total toffee family. Maybe it’s because our last name is the same as a toffee candy bar or maybe it’s because we can’t resist the crunch. Either way, Hampshire Toffee would be the perfect gift for us and I bet you know someone who is the same! The Almond Toffee bag above comes in a gift box all ready to go. Made with sweet cream butter, Ghirardelli semi-sweet chocolate, toasted California almonds and just the right amount of sea salt, your recipient is sure to smile. Maybe they will even share! Hampshire Toffee also has gift boxes for Chocolate Toffee (without the nuts) and non-GMO Toffee Pop(corn). It all looks so good! YUM! Are you hungry yet? What Fabulous Food for Gifts do you want to try first? I partnered with these Fabulous Food for Gifts brands for this post and links may be affiliate. All opinions are my own. This giveaway will end on December 2, 2016 at midnight MST. Winners will be drawn via rafflecopter. Once a winner is drawn I will contact them and they will have 48 hours to reply before I draw a new winner. Giveaway is open to anyone in US and you must be 18 years of age or older. Giveaway not affiliated with Facebook & I release them of liability. Winner will be posted in the rafflecopter widget. I love food! I have heard a lot about Home Chef and would like to try it! I like receiving food as gifts because it can often give us a chance to try new things. My family enjoys receiving food gifts from friends and neighbors. It's nice to have a consumable to enjoy on occasion. I loooove giving food as a gift. Consumable gifts are my favorite because people can enjoy them, and then they don't make more clutter! Justins peanut butter cups are my favorite! I love trying new food! Anything chocolate is usually right up my alley...I'm game for all though! Im picky about my food, but my fiancé loves everything. I think he would love getting food as a gift, and Ive thought about some of these for him. Food is always a fun gift! I would love to try the Hampshire Toffee. Justin products are great...that is my favorite...love to get food as gifts. We love giving and receiving food gifts, especially gourmet foods. I am wanting to try this toffee right now! I do like getting food gifts. My husband likes to buy food gifts for others. Food Gifts are always exciting to give & receive! The Tucson Tamale – Box of Happiness delivered right to your door from Tucson, AZ. is something I'd really love to try!! SunRidge Farms chocolate goji berries--YUM! It all looks great, but that is the first food I want to try. I really love getting good food as gifts! I love to receive food as gifts especially the homemade candies. I love the Hampshire Toffee. Yes I love receiving food as gifts because usually it's something I really love and/or it's something new that I have never tried and I'm excited about that especially the Justin's Peanut Butter Cups. All of these companies sound great to me. I love giving food as a gift - it's an easy way to gift a whole family. I love trying new foods. Love it when I find something new the kids will eat. I love receiving food for a gift. It's always fun to try something new. I love receiving food gifts and like to give food gifts. A good friend has spoiled me with gifts of food that magically appear as a surprise through the magic of the internet. I have discovered some wonderful companies this way and learned to appreciate surprises. Excited to try all of these great products! I love to receive and give food gifts for presents! I love getting food gifts. I give them as well. I do like getting food as gifts especially chocolates. This prize looks amazing, I grew up in California but now live in Washington and I miss good tamales and the toffee looks amazing. Love receiving food and I have been hearing a lot of good things about Hampshire Toffee. I love getting food, yesterday I received some freeze dried fruits that were great. I love receiving food as a gift. I enjoy trying new foods. Yum! I'm most excited about the tamales but it all looks delicious! I love food. My family always have the best yummies for the holidays. We will play games and hang out around the table. Having niblets and having fun. A perfect day. I love giving and receiving food for gifts! I try to have a few homemade foods to share. I do like getting food gifts. Especially for items I've never tried before. I love to receive food gifts and these companies would be so great to sample their great selections! Yes...I love to receive food as a gift...and I love to give food as a gift. Thank you! I love receiving food as a gift. The chocolate covered almonds and the peanut butter cups sound wonderful. I love winning food prizes because I get to try all kinds of new things. Justin's has some great products. I love receiving food gifts, especially foods or coffees that are hard to find in stores. I love winning prizes like this because I can give them to my family and friends as gifts! Those chocolate little organic dreams look amazing. Can someone tell my husband! I love Justin's peanut butter cups, but I think the Sunridge Farms chocolate covered goji berries sound really good to and I haven't tried those before. The Peanut Butter cups seems like a gift I would like. Thanks for the giveaway. I've never been given food as a gift but I sure wouldn't mind it! BTW I can have tamales year round - we have a little store right around the corner from us that sells homemade tamales or I can ask my MIL and she'll make some for me! Yummm! With this cold front that just blew in, I'm sure there will be a HUGE line tomorrow and Sunday morning!!! Yes gifting food is great idea to give and to receive. I love receiving food as gifts! Thank You for this fabulous giveaway! Yes, I love receiving organic non gmo snacks such as SunRidge Farms Organic & Fair Trade Dark Chocolate Covered Almonds. Food gifts are always welcome - especially sweets! The Hampshire Toffee looks particularly good to me! I don't get much food as gifts (except from my boyfriend) but I do love to give food. I feel like there is so much "stuff" in the world, it is better to give things that get used up. We just love getting food gifts in our family .Hampshire Toffee sounds amazing to eat I love Toffee. I like all the products here they all sound so good. I love getting food as a gift, those SunRidge Farms Organic Dark Chocolate Covered Espresso Beans sound yummy! Chocolate is always good as a gift or anytime. When I give gifts, I tend to do a food item, too. Food is something everyone could use as a gift, and it's really fun to get! I think food is a great gift. It's something everybody loves and can use. I think the chocolate covered cashews look amazing. I'm especially excited fur Dave's gourmet spicy sauces! My husband is a spicy sauce addict, I'm always looking for new ones for him to try. Food is one of the best gifts! It's just so thoughtful and practical! Love receiving food gifts! Am excited to try the Hampshire toffee. Yum! Everyone loves food. It's the best present to give or receive. I love receiving food for gifts and I really like the SunRidge Farms! I love to gift baked goods and food to others during the holidays and I love to receive the same from others! I do like receiving food baskets at holidays but I like it when it is quality food, not just junk bass. I really like the sounds of the Tucson Tamale. I haven't heard of this one and tamales sounds amazing. We love them but it is nothing I would ever have the time to make from scratch. As a college student on a limited budget I always love to receive food as gifts! The Tamales sound fantastic! I love to give and receive food as gifts. My father and father-in-law are really difficult to buy for so we typically get them some type of food box or item. We frequently exchange homemade food as gifts for Christmas. We love it. I love receiving food as gifts especially this type because I can not afford to treat myself, I am excited about SunRidge Farms dark chocolate is my weakness. All of these products look and sound delicious, I would be overjoyed to receive just one of them. Thank you for the chance to win them all. I like receiving gourmet food items that I would normally not buy myself. Wow! Food is actually my preferred gift for any and all occasions! The Tucson Tamales sound really great- love the flavor variety. And I am already a huge Justin's fan--wooo woo for their dark peanut butter cups! I love food gifts. Thank you for the great giveaway! I love to give and recieve food gifts especially for the holidays. I have some family members on my gift list that love sweets. I'm most excited about the Justin’s Peanut Butter Cups & Snack Packs! Thank you for this wonderful giveaway! I love to get food as gifts! I also love to give it - especially choffee and chocolates. I like to receive food as a gift, especially home made/family recipes. I love receiving food gifts and I also love giving them. I'm very excited about the pumpkin tamales! I live trying new things and free food always tastes better. I'd love to try the tamales. the Hampshire toffee...i'm a sucker for toffee! Who doesn't get excited about food! Justins peanut butter is fabulous. I do like receiving food gifts. I love getting food for a gift! I'm excited about Justin’s because I love nut butter! I like getting food as a gift. It's great to try something that you may not have bought for yourself. The coconut chews sound great. I love trying new foods so anything involving food is the perfect gift for me! It is always fun to receive food as gifts. I spend a fortune at the market so I definitely love receiving and trying new items. I love to get food gifts, I get to try foods that maybe I have not had before. Yeah I like getting food as gifts. I like trying new things. I really love receiving food as gifts. Everyone love to eat!! Food is my life! Tamales is what I am most excited for! I love trying new foods. In a way it's like traveling to a new place. Yes, I do like getting and giving food gifts. Oh yes.... I love receiving food gifts. It's always exciting to try new items. I do love receiving food as a gift. I would be totally happy if someone gifted me SunRidge Farms snacks. I love receiving food as gifts. I am excited about all of the companies above. I have never tried any of their products and they all look so good. I just love trying new foods. I love getting food gifts. Justin's is my favorite brand of nut butters. I love their Maple Almond Butter. I'm excited to try all the new foods. I do like receiving good as a gift. My daughter would like the Justin’s snacks. I’d really like to try the SunRidge Farms dark chocolate goodies! That toffee looks amazing! I do enjoy getting food as a gift... especially if it is sweet! I love food as a gift, it gives me an excuse to try something new I might not otherwise try. I LOVE food gifts-- and love to give baskets with a theme! I love getting & gifting foodie stuff. IMHO, Justin's Dark Choc. PB Cups are the finest around. Yes I love food gifts! I have been really wanting to try Tucson Tamale. Their food looks so good! I love receiving food as a gift. It's so fun to try new things or things you wouldn't normally buy. I am really wanting to try the Hampshire Toffee . I love food as a gift, both ingredients that I can use when I cook or meals to make my life easier. I want to try the Hampshire Toffee and Justin’s s. I am a snack food addict. This is a great way to be able to try foods that I would not normally have access to. I love giving and receiving food as gifts. You can't go wrong with a favorite food! I love receiving food gifts!! That Hampshire Toffee looks delicious!! I love receiving Food as gifts. I love giving and receiving foods as gifts. I do like to get food related gifts. Food makes awesome gifts! I love Justin's PB. I love getting food as a gift, especially when they fall in line with whatever diet plan I am on. I love food as a gift! I actually prefer it because food is always a winner with me when it comes to receiving and giving gifts. Who doesn't love a nice meal? I'm excited about all these brands because I've never tried them before. Thank you for the generous giveaway. I love food gifts and I am excited about all of these food items! This would be great fun to win! I do enjoy food as a gift sometimes, it kind of depends on if it is something I like. Yes, we love receiving food because we are such foodies. I am excited about the Hampshire Toffee. Food is always a good gift to receive! I'm excited about about Tucson Tamale! They look so delicious!! It is always fun to get new foods as gifts or in the mail to try! We usually try it out as a family and have fun. The toffee and Tucson Tamales are definitely something we would like to try out. I am excited to try Justin’s Peanut Butter Cups & Snack Packs! I love getting anything in the mail and food is even better. I love Justin's treats! So good! Food gifts are always welcome... bring on the Hampshire Toffee!! Yes I love to receive food gifts and I would love to try Justin's. Most definitely love getting food as a gift. I especially love getting new brands and flavors to taste. I love receiving food as a gift cause you never know what you're gonna get. It's an additional surprise aside from receiving a nice holiday gift. I love super spicy foods and would look forward to trying the Dave’s Gourmet Spicy 6 Gift Pack from the pack of goodies. I love receiving food for gifts love love it! I would love to receive food as a gift. always ready to try something new. I love to receive food as a gift! There is nothing better than getting chocolate as a present! I love getting food baskets. I would love to get food, especially Justin dark chocolate peanut butter cups. They are delicious. This would be a great prize to win. Especially the Home Chef. I love Food as gifts!! I love to cook and love to try new food items! I love receiving food gifts especially when its something i've never had before, I love trying new things! I'm excited to try hampshire toffee! Food makes for great gifts! they provide a great experience and do not take up space once eaten (minimalists love that!). I am always excited to receive food as gifts. My brother in-law sent us some bbq sauce years back and we order it regularly I'm especially liking that hot sauce! Yes, I love receiving food as a gift. Its great to try new different type of food. I have never received food through the mail. But I would love to have this come through the mail to try. I love receiving food gifts! I also love giving local food gifts especially during the holiday season. I love receiving food as a gift. I'm excited about the Justin's products. I always love receiving food gifts! It helps us to cut down on our grocery shopping bill. I am excited about Justin's and Hampshire Toffe!! And all these goodies!! YUM! I always love yummy treats. I have heard a lot of good things about Justin's and have been wanting to try their nut butters. I love receiving food as a gift and I would love to try all these brands! I haven't gotten to try any of them yet. I love receiving food at any time, for any occasion, and for any reason. Don't send me flowers. Send me food. Food is a wonderful gift! All of these sound good, husband would like the hot sauce! I really want to try SunRidge Farms – Organic, Fair Trade cocoa dark chocolate cashews! I can only eat organic chocolate and am always happy to find new products. Thank you for the awesome giveaway! I would LOVE to try that Toffee!! Mmmm!!! Receiving food as a gift is exciting to me! 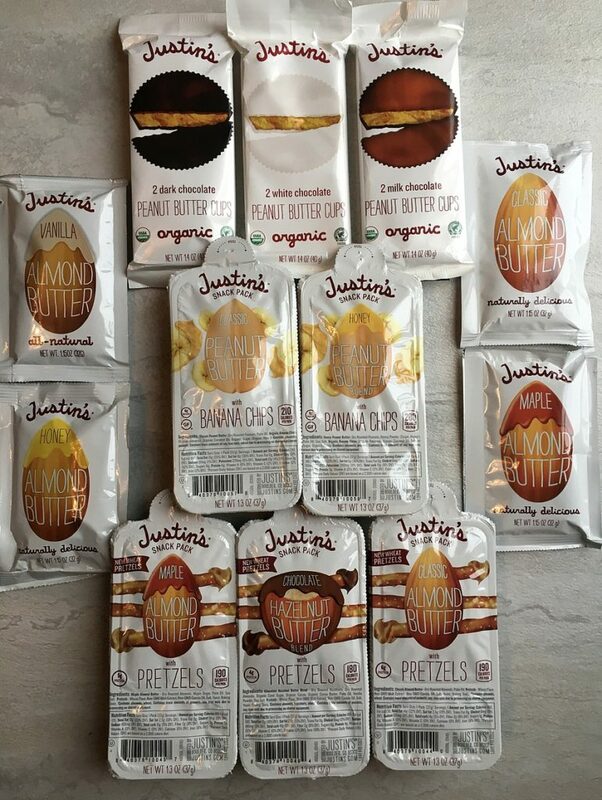 I'd love to try the Justin's products especially with the chocolate added! Yes they are cool - I like the ones with meat and cheese. We have one friend who always gives us gifts of food, which we always appreciate and use. For the last few years, we've followed his lead and give him food gifts, too. I think his feeling is that he enjoys giving gifts he knows will be used, and I think he's on to something there. Love your choices of food gifts--thanks for the reviews and the chance to win, too. The Hampshire Toffee looks yummy! I LOVE receiving food as a gift! I definitely think it is fun to try new things, and it is always so special to receive a box of stuff that you normally wouldn't buy, or is a new product that you haven't tried yet. :) I really want to try some candy from Hampshire Toffee! Yes i love receiving food as gifts. I like to get food gifts. Something special from Trader Joe's or Whole Foods! 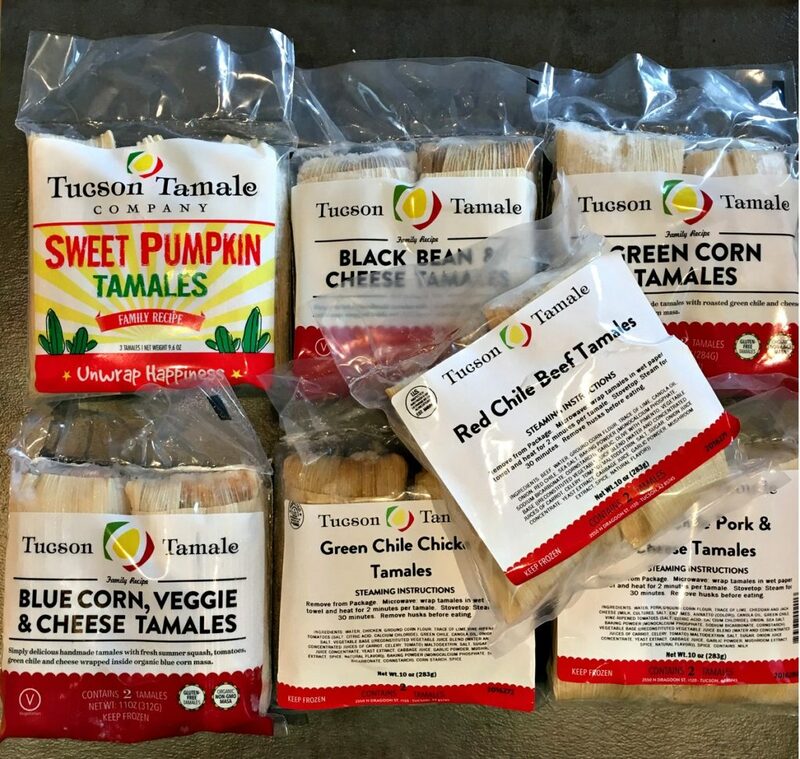 I love receiving food gifts :) All the items look super yummy, I've never tried any items from Tucson Tamale & SunRidge Farms so would look forward to trying items from their company. I am excited about the Tucson Tamales! I love Tucson Tamales! They are the best tamales I have ever tasted. I love food gifts! They always contain items I love, but would probably not purchase for myself. I love food gifts, especially fruit. I love food gifts! The tamales sound AH-mazing! I do like food gifts as long as it's prepackaged. I am excited about the hampshire product. Food gifts are awesome! I love when they contain items I have never tried. I love to receive food gift. Gift Baskets are great also so that you can try several different products! Food is an awesome gift, especially when it is new and different! I wish I would get food for all the holidays.! I love getting food as gifts especially from companies I haven't tried yet. I love food as gifts! All of these companies sound neat especially home chef! I always love food gifts! I do enjoy getting food gifts. I have found some gems I would have missed knowing about. Hampshire toffee sounds melt in the mouth good. Yes, I love giving (and receiving) gifts of food at Christmas! I enjoy receiving food gifts always a delicious surprise to enjoy with family and share with friends too. All of the companies sound amazing and yummylicious. Thanks for the wonderful chance. Very generous. Good luck all. Happy Holidays. Other than candy, I don't think I've ever received food as a gift. Oh wait! I have gotten Figi cheese boxes. And I did like them. This would be a little more upscale. I love receiving food as gifts, especially Edible Arrangements. I would love to try the Hampshire Toffee and the SunRidge Farms chocolates. The dark chocolate Espresso Beans sound so good. food gifts are always on top of my list. SunRidge Farms items look so yumm.. 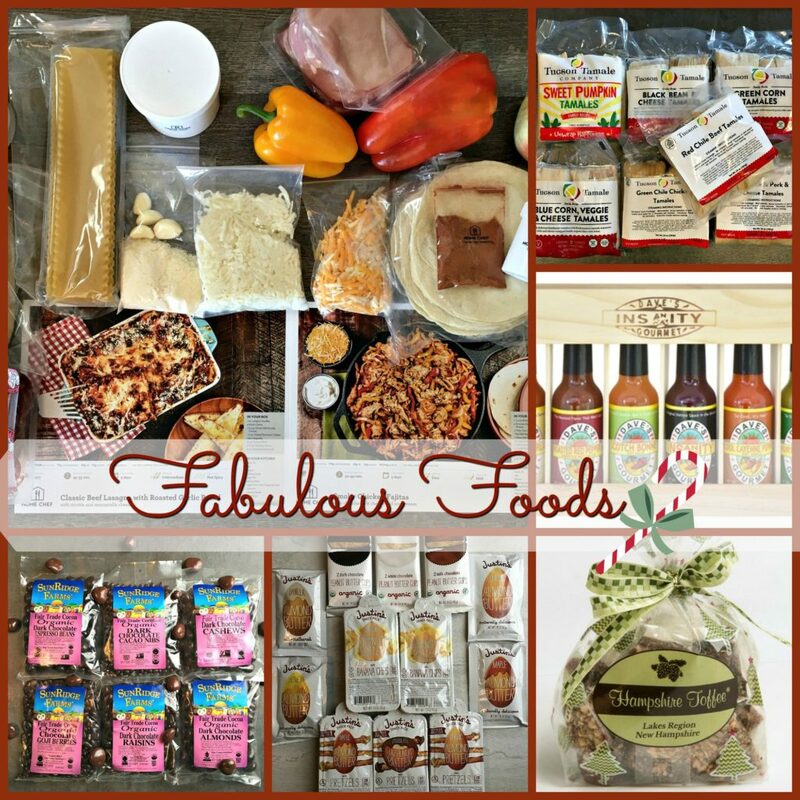 I'm very excited about sunridge farms products I love food gifts fingers crossed! I love receiving food as gifts because it is a great way to try something different! I love getting food as gifts and trying new snacks....Justins seems like a great company. Peanut butter and chocolate...what could be better? Would love to receive a food gift from any of these companies, so awesome and thanks! I love receiving food as gifts and also giving it. I like trying new tastes and products. Yes, I love getting food for gifts and I love to give it as a gift too! 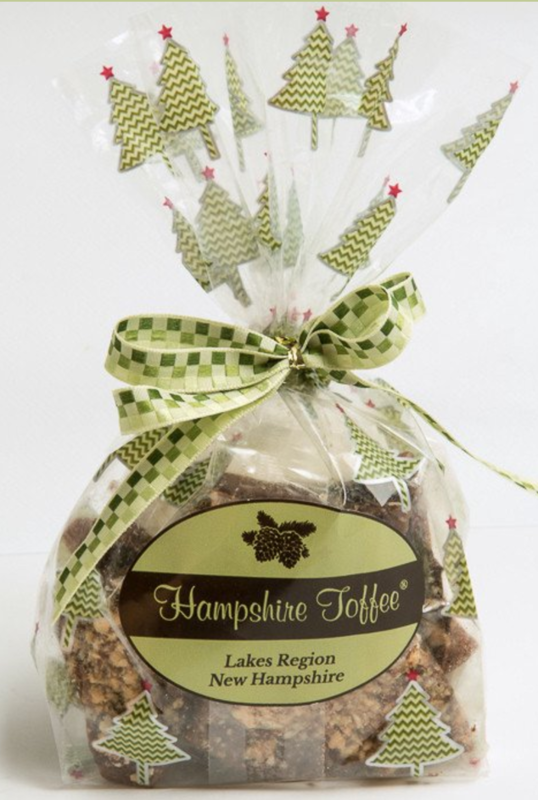 I'm really excited about the Hampshire Toffee handcrafted in small batches in New England. It looks and sounds SO yummy!! Thank you!! I do love receiving food as a gift! It lets us try out something new that could be wonderful! I love receiving food as gifts. I would love to try satans blood hot sauce. I'll take a gift of good food any day. I love tamales and want to try those. Thanks for the contest. I always like food as a gift! I love getting food as gifts.